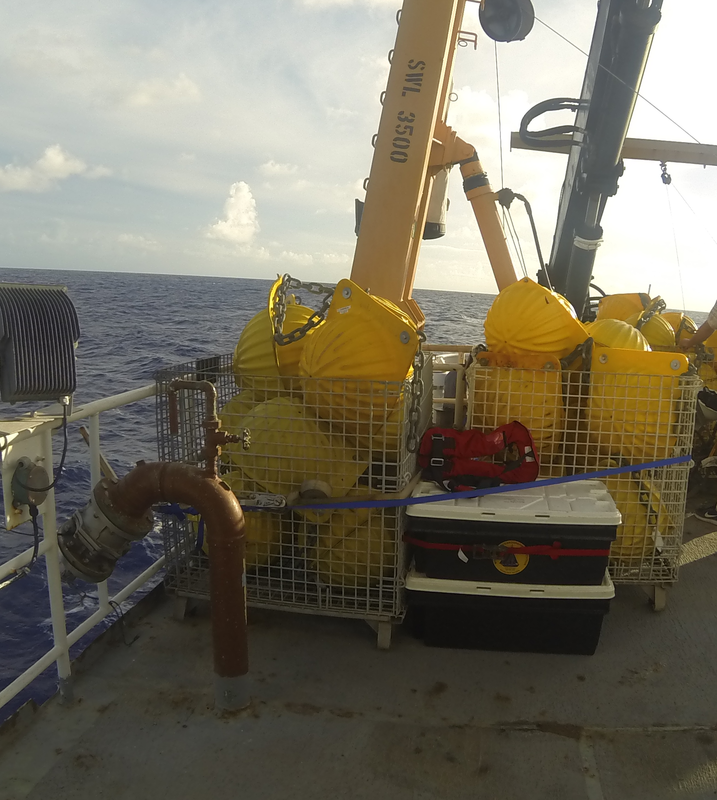 One of the primary objectives of this WHOTS project is to deploy WHOTS-13 mooring. This will be accomplished on our second day at sea. The mooring site was chosen because it is far enough away from Hawaii so that it is not influenced by the landmasses. 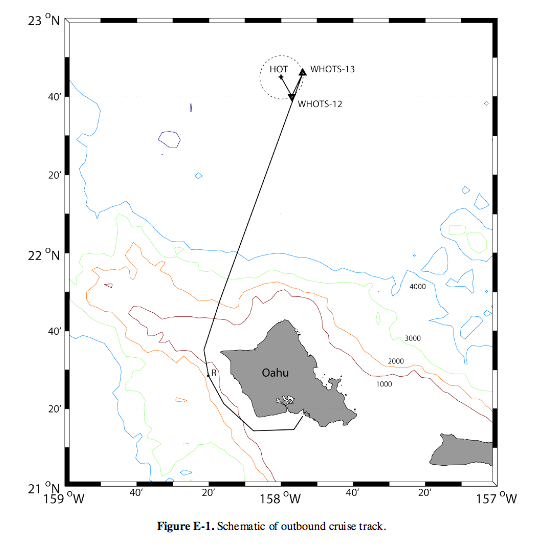 Mooring 13 will be located near mooring 12 in the North Pacific Ocean where the Northeast Trade Winds blow. Data collected from the moorings will be used to better understand the interactions between the atmosphere and the ocean. Instruments on the buoy record atmospheric conditions and instruments attached to the mooring line record oceanic conditions. There is a lot more going on than just plopping a mooring in the sea. Chief Scientist Al Plueddemann from Woods Hole Oceanographic Institution and his team began in-port prep work on June 16th. 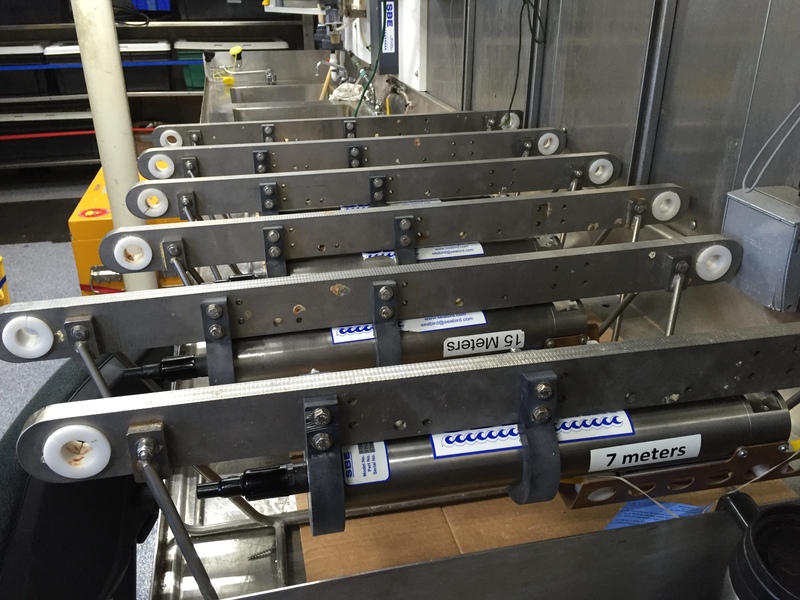 This included loading, positioning and securing the scientific equipment on the ship. A meteorological system needed to be installed on the Hi’ialakai to collect data critical to the mission. And then there was the assembly of the buoy which had been shipped to Hawaii in pieces. Once assembled, the sensors on the buoy were tested. 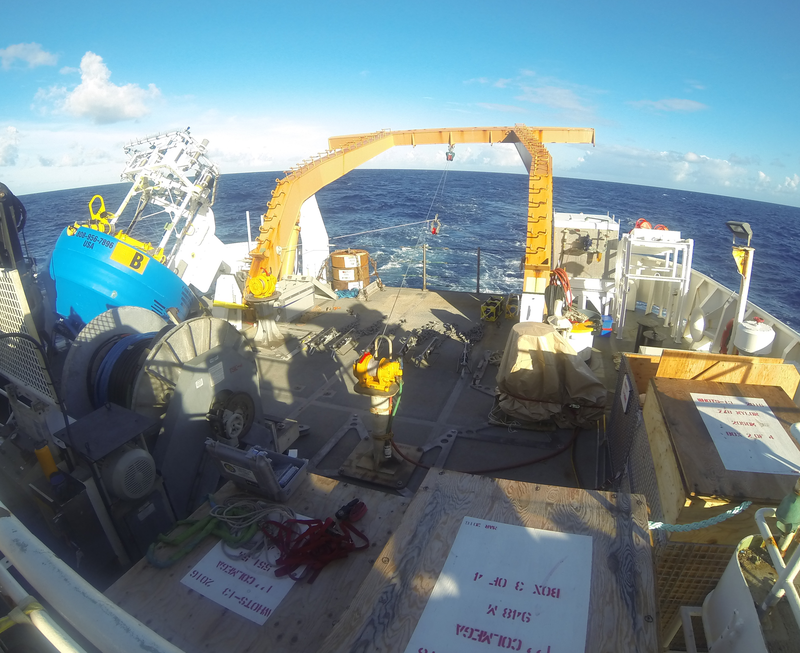 As we left Oahu, we stopped to perform a CTD (conductivity/temperature/depth) cast. This allowed for the testing of the equipment and once water samples were collected, the calibration of the conductivity sensors occurred. Sunday, June 26th, was the day of deployment. Beginning very early in the morning, equipment was arranged on deck to make deployment efficient as possible. And the science team mentally prepared for the day’s task. The deck before deployment began. The buoy is the blue item on the left. Promptly at 7:30 am, deployment began. The first stage was to deploy the top 47 meters of the mooring with sensing instruments called microcats attached at 5 meter intervals. A microcats has a memory card and will collect temperature, conductivity and pressure data about every three minutes until the mooring is removed next year. Microcats readied for deployment. They are lined up on the deck based on their deployment depth. This portion of the mooring is then attached to the surface buoy, which is lifted by a crane and lowered overboard. More of the mooring with instruments is lowered over the stern. The remainder of the mooring is composed of wire, nylon, 68 glass balls and an anchor. At one point, the mooring wire became damaged. To solve this problem, marine technicians and crew removed the damaged portions and replaced the section with wire from a new spool. This process delayed the completion of mooring deployment but it showed how problems can be solved even when far out at sea. After dinner, the nylon section of the rope was deployed. Amazingly, this section is more than 2000 meters long and will be hand deployed followed by a section of 1500 m colmega line. It was dark by the time this portion was in the water. 68 glass floats were then attached and moved into the water. These floats will help in the recovery of the mooring next year. The attachment to the anchor was readied. These glass floats will help when the mooring is recovered next year. The anchor weighs 9300 pounds on deck and will sit at a depth of 4756 meters. That is nearly 3 miles below the ocean surface. The crane is used to lift the anchor overboard. 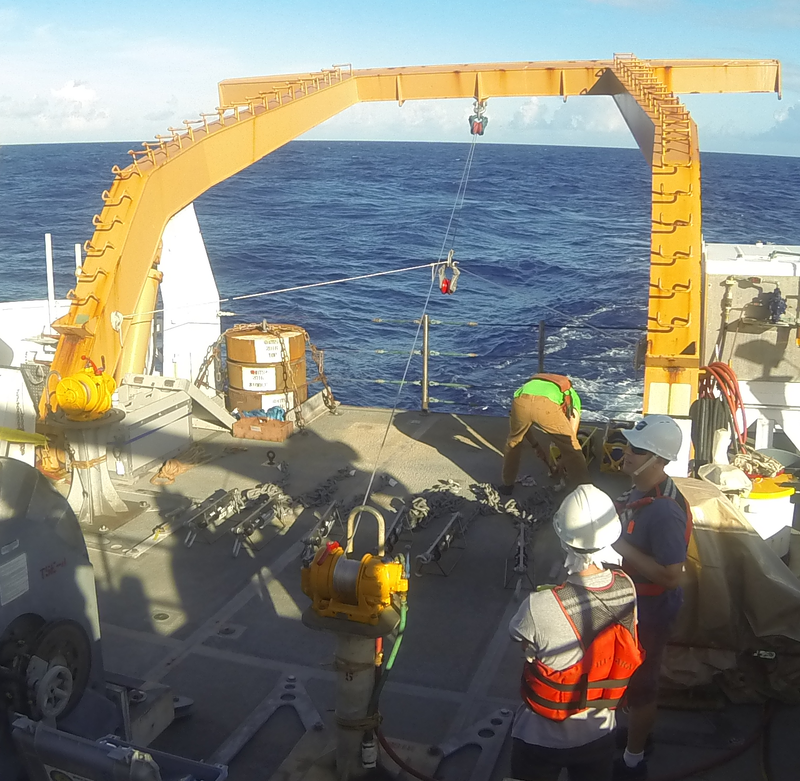 The anchor will drop at 1.6 m/s and may take about 50 minutes to reach the bottom. As the anchor sinks, the wire, nylon and the rest of the mooring will be pulled down. Once it reaches the bottom, the mooring will be roughly vertical from the buoy to the anchor. I sailed aboard NOAA ship Oscar Dyson in 2013 so I already had a general idea of what life aboard a ship would be. Both ships have workout areas, laundry facilities, lounges, and of course messes where we all eat. 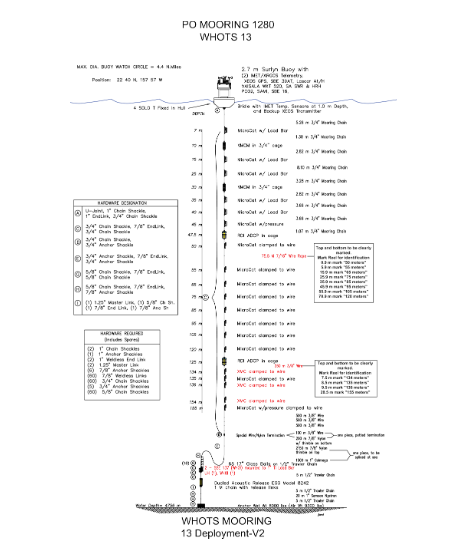 But on the Hi’ialakai, I am less likely to get lost because of the layout. A door that goes up is near a door that goes down. On our first day aboard, we held two safety drills. The first was the abandon ship drill. As soon as we heard 6 short and 1 long whistles, we grabbed our life jacket, survival suit and a hat. We reported to our muster stations. I am assigned to lifeboat #1 and I report the starboard side of 0-3 deck ( 2 levels up from my room). 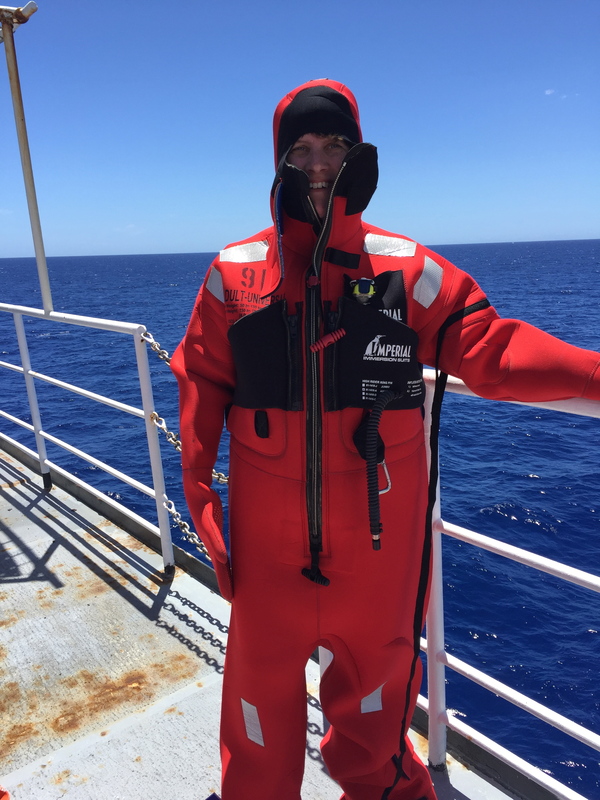 Once I arrived, a NOAA officer began taking role and told us to don the survival suit. This being my first time putting the suit on, I was excited. But that didn’t last long. Getting the legs on after taking off shoes was easy as was putting one arm in. After that, it was challenging. It was about 84 F outside. The suit is made of neoprene. And my hands were the shapes of mittens so imagine trying to zip it up. I finally was successful and suffered a bit to get a few photos. This was followed by a lesson for how to release the lifeboats. There are enough lifeboats on each side of the ship, to hold 150% of the capacity on board. Safety is an important aspect of living aboard a NOAA ship. It is critical to practice drills just like we do at school. So when something does happen, everyone knows what to do. A long whistle signals a fire. All of the scientists report to the Dry Lab for a head count and to wait for further instruction. I am reminded of how small our world really is. At dinner Saturday, I discovered one of the new NOAA officers was from Cottage Grove, Oregon. Cottage Grove is just a short drive south of Eugene. She had a friend of mine as her calculus teacher. Then a research associate asked me if I knew a kid, who had graduated from South Eugene High School and swam in Virginia. I did. He had not only been in my class but also swam with my oldest son on a number of relay teams growing up. Small world indeed. The Hi’ialakai was once a Navy surveillance ship (USNS Vindicator) during the Cold War. NOAA acquired it in 2001 and converted it to support oceanic research. 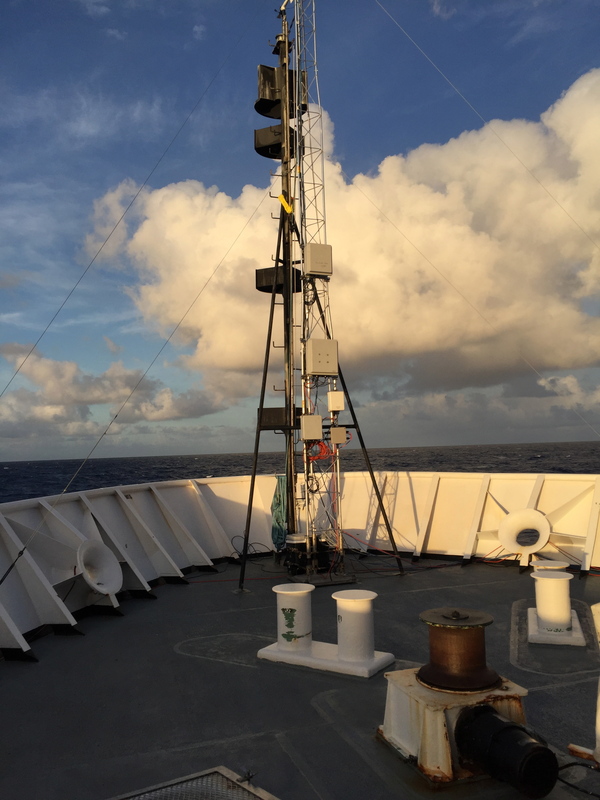 This entry was posted in 2016, Julia Harvey 2016, NOAA Teacher at Sea and tagged atmosphere, Hawaii\, Hi'ialakai, meteorology, microcats, Mooring, oceanography, safety drill, Woods Hole Oceanographic Institute. Bookmark the permalink.